Red Sox top prospect Rafael Devers has played in just two games at the major league level, but he has already made an impact. On Wednesday, he recorded his first major league hit, and it happened to be a 427-foot home run to center field. He also singled off left-handed reliever Marc Rzepczynski. Devers is 2 for 8 with the home run and a pair of walks so far. Check out the SoxProspects.com YouTube page for some video of Devers in Double-A earlier this season. The Red Sox also made a trade with the San Francisco Giants and acquired utility player Eduardo Nunez. 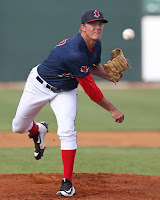 In the deal, Boston gave up SoxProspects.com's 17th ranked prospect Shaun Anderson (pictured). Anderson is a right-handed pitcher who was drafted in the third round out of Florida in the 2016 draft. They also sent 17-year old right-handed pitcher Gregory Santos to the Giants. Santos is from the Dominican Republic and was acquired as an international free agent in 2015. For more in-depth analysis of who the Sox gave up to get Nunez, check out SoxProspects.com's Director of Scouting Ian Cundall's Trade Analysis. Alex Speier of the Boston Globe also gives his analysis on the trade. Baseball America recently released their midseason top 10 prospect lists for each club. Here is Ben Badler's Red Sox list and analysis. The list includes Devers at the top and three 2017 draft picks. Badler has Michael Chavis ranked third, while SoxProspects.com has him ranked fourth. Olivia Healy of WEEI.com wrote a story on Chavis and his mindset on playing the same position as Devers. Chavis also discusses his family and the struggles he faced early in his career with the Sox organization. Chavis is having a monster season in 2017, batting .307/.372/.605 with 24 home runs and 73 RBI between High-A Salem and Double-A Portland. Justin Haley was returned to the Red Sox from the Minnesota Twins and assigned to Triple-A Pawtucket. Haley was drafted by the Red Sox in the sixth round in 2012 and was later selected in the Rule 5 draft by the Los Angles Angels and was then traded to Minnesota. Haley made 10 appearances for the Twins in 2017 and had a 6.00 ERA in 18 innings of work. In other roster moves, Ben Taylor, Kyle Kendrick, Jantzen Witte, and Taylor Grover were all placed on the disabled list. Also, make sure to help keep SoxProspects.com running for free with a donation in this year's Annual Donation Drive. Thank you for your continued support.